In 1969 the Women’s Council of the Geneva Historical Society was formed as a service organization. With annual dues of $2, all female members of the Historical Society were invited to join the Council. By-laws were written with officers (president, vice president, secretary, corresponding secretary, treasurer, and a various committee chairs) and a mission “to further the work of the Geneva Historical Society by providing volunteer services and financial support as well as assisting in the civic, social and educational purposes of the Historical Society.” The first officers were Mrs. Thomas Quigly President, Mrs. Edwin Elliott VP, Mrs. Charles Boswell Treasurer and Mrs. William Allen Secretary. Among their first projects were reprinting An Elegant But Salubrious Village by Warren Hunting Smith and printing notecards of Prouty-Chew House and Rose Hill Mansion all of which were sold at Prouty-Chew. 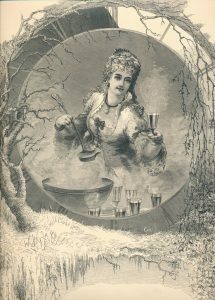 On December 4, 1969 a Silver Tea and Christmas Sale was held at Prouty-Chew and this annual event became the Wassail Bowl and Sale . The following year an antiques show and sale was held at Rose Hill and it would be a staple event for the next 18 years. Education, volunteerism, and fundraising were the major tenets of the Council. Whether as a tea, lunch or dinner, programs with a business meeting were held throughout the year. Topics ranged for local interest (Rose Hill, architecture, Seneca Lake) to gardens, Jell-O, 19th century clothing and outhouses. Council members also provided volunteers to serve as docents at Prouty-Chew and help with special events. The Council took a particular interest in the Historical Society’s costume collection and for several years the Council had a Costume Guild that did special projects like conducting inventories, making padded hangers, and sewing labels into clothing. Perhaps the primary function of the Council was raising money for the Historical Society. This was done through the Wassail Bowl and Sale, Antiques Show and Sale, and selling refreshments at the Civil War Encampment at Rose Hill and the Geneva afghans. Money raised has been used for general operating expenses, curatorial expenses, office supplies, newsletters, brochures for Prouty-Chew and scholarships to the Historical Society’s history summer camp. As with most organizations, things change. The number of programs decreased each year, in 1986 membership was open to all members of the Historical Society and the Council became the Wassail Bowl Committee in 2012. Yet the purpose remains the same – financially supporting the Historical Society. To date the Council and Wassail Bowl committee has raised $281,544.21 for the Historical Society. This year marks the 50th Wassail Bowl and Sale. Join us on December 1 at The Presbyterian Church from 10 am to 2 pm. Enjoy a glass of wassail, shop for fresh greens , baked goods or gifts and get into the holiday spirit while supporting the Historical Society.